The Basilica of Saint Joseph’s Oratory possesses a magnificent organ that is ranked among the ten most prestigious in the world. It bears the signature of German organ maker Rudolf von Beckerath (1907-1976). The music of the Beckerath organ accompanies prayer and religious ceremonies that are celebrated in the Basilica. Concerts featuring works from various musical periods showcase the power of this magnificent instrument. Review the program and schedule of the organ concerts series. This mechanical-action instrument is composed of 5811 pipes, forming 78 stops organized into six divisions: the Positive, the Great, the Bombard, the Swell, the Echo and the Pedal. The console has five keyboards and a pedalboard corresponding to the six divisions of the organ. Its imposing façade displays pipes as long as 9.75 m (32 feet). The organ was fashioned over a period of two years, from 1958 to 1959, in Beckerath’s workshops in Germany. It took seven months to install the instrument in Montreal. On November 13, 1960, the Oratory’s organ was blessed and inaugurated with a recital by the famous French organist, André Marchal. After more than 50 years, a complete restoration was needed. From September 2011 to June 2012, Juget-Sinclair organ builders of Montreal disassembled, cleaned and restored every component of the organ in the Basilica. No major changes were made; only a few mechanical elements were replaced. The integrity of the instrument’s sound was scrupulously preserved. Two inaugural concerts took place in the Fall of 2012 to celebrate the Beckerath organ’s new lease of life. The organ in the Crypt Church, opus number 708, was built in 1917 by Casavant Brothers of Saint-Hyacinthe, Quebec. The original instrument consisted of 19 stops with two keyboards and a pedalboard. A restoration was undertaken in 1962, adding sixteen new stops and a third keyboard. Then in 1989, the instrument was completely “refurbished.” On this occasion, a new stop was added, and the console equipped with a new computerized system. Also, the blower, leather pieces and other worn parts were replaced. More recently, in 2007 and 2008, the organ and its casework were cleaned, adjusted, restored and enlarged. All of the organ pipes are now contained inside the casework, presenting a more homogeneous sound and an elegantly harmonious visual appearance. 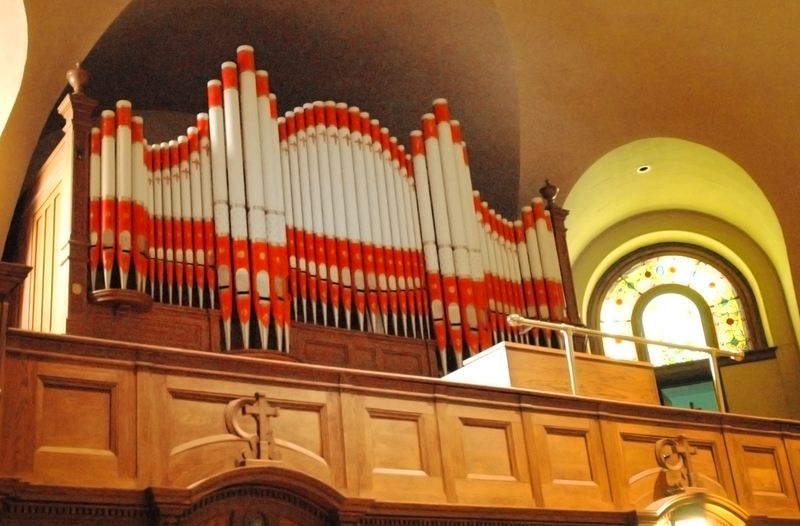 The organ pipe façade was also expanded and painted in the English style, common among the instruments which Casavant Brothers constructed at that period. This beautiful loft organ now consists of 36 stops on three manual keyboards and a pedalboard.